EVERETT, Wash. – The Everett Silvertips (@WHLSilvertips) announced defenseman Noah Juulsen and forward Nikita Scherbak of the Montreal Canadiens, goaltender Carter Hart of the Philadelphia Flyers, Brycen Martin of the Buffalo Sabres, Ben Betker and Carson Stadnyk of the Edmonton Oilers and Eetu Tuulola of the Calgary Flames have been named to their respective teams’ rosters for the National Hockey League rookie camp period, opening this month. 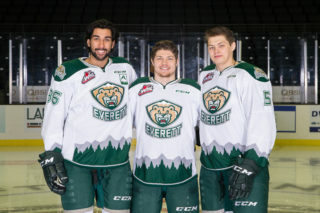 Juulsen (1st round, 2015), Hart (2nd round, 2016), and Tuulola (6th round, 2016) are currently on the Silvertips roster, previous selections in the NHL Entry Draft. Scherbak and Stadnyk previously suited up for the Silvertips during the span between 2011-16. Calgary – Sept. 15-19, Calgary, Alberta and Penticton, B.C. Edmonton – Sept. 15-21, Edmonton, Alberta and Penticton, B.C. Philadelphia – Sept. 19-21, Voorhees, N.J.
Betker, 21, is set to enter his second season in the pro ranks after splitting his rookie campaign between Norfolk (ECHL) and Bakersfield (AHL), totaling 17 points in 49 games at the ECHL level while adding a pair of assists in 14 games with the Condors in the AHL. Betker spent all but one game of his WHL career in a Silvertips sweater, collecting 58 points and 265 penalty minutes in 201 career games with Everett and Portland. The 6-foot-6, 223-pound defenseman served as Silvertips alternate captain and earned career-highs in points (31) and assists (25) in 2014-15, appearing in 64 games. He earned five points in 20 career WHL playoff games and was originally was selected by the Oilers in the sixth round (158th overall) of the 2013 NHL Entry Draft. Juulsen, 19, is prepared to enter his fourth full season with the Silvertips and participated in preseason action last year with Montreal. The 6-foot-2, 185-pound defenseman was named to the WHL (West) All-Star Second Team as he gathered in 28 points (7g-21a) in 63 games, additionally posting a pair of assists in six playoff games. Juulsen skated in the CHL/NHL Top Prospects Game in 2015, the same year he was selected by Montreal in the first round (26th overall) of the NHL Entry Draft. Juulsen has picked up 90 points (18g-72a) and a +33 in 191 career games with the Silvertips. Hart, 18, is preparing for his third season in a Silvertips uniform after capturing the Vaughn Canadian Hockey League and Western Hockey League Goaltender of the Year (Del Wilson Memorial Trophy) awards last season, followed by his selection of the Philadelphia Flyers in the second round (48th overall) in the 2016 NHL Entry Draft as the first netminder picked by any NHL team in June’s draft. Honored on Sept. 6 by the Seattle Mariners by throwing out the ceremonial first pitch at Safeco Field, he is the first greater Seattle area based goaltender to win the CHL Goaltender of the Year award since 1998-99 (Cody Rudkowsky, Seattle). The 6-foot-2, 180-pound goaltender was named Silvertips Most Valuable Player last season, earning a WHL best 35 wins and was second in goals against average (2.14), tied for second in shutouts (6), and second in minutes (3,693), en route to a 35-23-1-3 record and First Team All-Star selection in the Western Conference of the WHL. He suited up in the CHL/NHL Prospects Game in Vancouver and last summer earned a gold medal with Team Canada at the 2015 Ivan Hlinka Memorial Cup. Hart is 53-29-3-7 with a .917 save percentage in 95 career games with the Silvertips. Martin, 20, tied a career high in goals (6), assists (31) and points (37) in 66 games last season with the Silvertips and Saskatoon Blades. He was fifth on the Silvertips in scoring and also notched six power play points after being acquired by the club on Dec. 1, also appearing in all nine playoff games while registering a game-winning goal and an assist. The 6-foot-2, 202 pound defenseman was originally selected by the Sabres in the third round (74th overall) of the 2014 NHL Entry Draft, attended his first training camp with Buffalo last season and made his professional debut at the end of the season with the Rochester Americans, skating in two games with the Sabres’ American Hockey League affiliate. In 277 career WHL games with Everett, Saskatoon, and Swift Current, Martin has 131 points (21g-110a) and 154 penalty minutes while adding four points (1g-3a) in 20 career postseason games. He skated for Canada Pacific at the Under-17 World Hockey Challenge in 2012-13, leading the tournament’s defensemen with nine points (2g-5a) in five games. Scherbak, 20, posted 23 points (7g-16a) in 48 games last season, his first pro campaign with the St. John’s IceCaps (AHL). 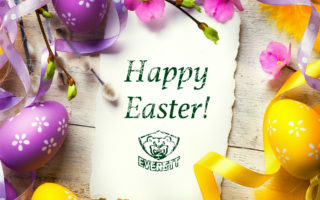 He preceded that as the Silvertips leading scorer in 2014-15, notching 82 points (27g-55a) and a +33 rating in 65 games while helping Everett claim the U.S. Division title. The 6-foot-1, 174 pound forward collected 160 points (55g-105a) in 130 points through two WHL seasons with the Silvertips and Saskatoon Blades and was selected in the first round (26th overall) by Montreal in the 2014 NHL Entry Draft. Stadnyk, 21, recently completed his WHL career last season, suiting up in 286 career games in a Silvertip sweater. The 6-foot-2, 185 pound forward, recently committing to the Univ. of Saskatchewan (CIS), ended his WHL career tied for fifth in goals (79), all-time as a Silvertip and compiled 169 points while adding 19 points in 28 career postseason games. He only missed four regular season games in his entire career. Serving as an alternate captain last season, he helped guide the Silvertips to a U.S. Division title the season prior with career-highs in points (69), goals (27), and assists (42) in 71 games. One of two new Import Draft selections on this season’s Silvertips roster (along with Mario Mucka), Tuulola was selected by the Silvertips in the first round (40th overall) and was additionally selected by the Calgary Flames in the sixth round (156th overall) in the 2016 National Hockey League Entry Draft. He skated with the Flames in development camp in July, posting a hat trick in a camp game on Jul. 7 in Calgary. The native of Hämeenlinna, Finland was ranked 19th by NHL Central Scouting among skaters (European) entering this year’s draft, and participated in the NHL Scouting Combine in Buffalo. Tuulola, 18, posted two goals and an assist through four games in Silvertips preseason action. The 6-foot-3, 227-pound forward skated for HPK U20 in the Jr. A SM-liiga league last season, earning nine goals and 14 points (9g-5a) in 29 games. In 62 career games with the league, Tuulola posted 42 points (30g-12a) and 30 goals along with a +9 rating. Suiting up for Finland at the U18 World Junior Championship, he helped guide the program to a gold medal with four points in seven games of competition. Tuulola also represented Finland’s Under-18 squad at the Ivan Hlinka Memorial Tournament, earning four points (2g-2a) in five games. His father, Marko, was a defenseman for 25 seasons in the Finnish Elite League, the Swedish Hockey League, and Switzerland’s National League A, additionally representing Finland at the 2001-02 World Championship. Eetu’s brother, Joni, is a 20-year old defenseman in Finland and was selected by the Chicago Blackhawks in the sixth round of the 2015 NHL Entry Draft. 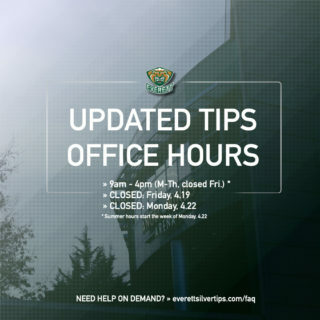 The Silvertips will open the 2016-17 schedule with a “home-and-home” series against the Vancouver Giants, launching Friday, Sept. 23 in Langley, B.C. 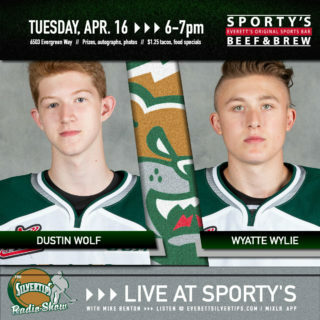 at 7:30 p.m. (Fox Sports 1380/WHL Live/Tips App) followed by the Silvertips home opener against the Giants, Saturday night at 7:05 p.m. at XFINITY Arena. Single game tickets are now on sale by visiting online, the Tips App, calling (425) 252-5100 or visiting XFINITY Arena in person. 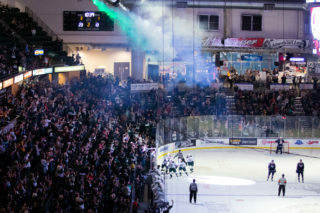 The Silvertips complete preseason play this weekend with a home-and-home series with the Seattle Thunderbirds, concluding at XFINITY Arena this Saturday, 7:05 p.m.